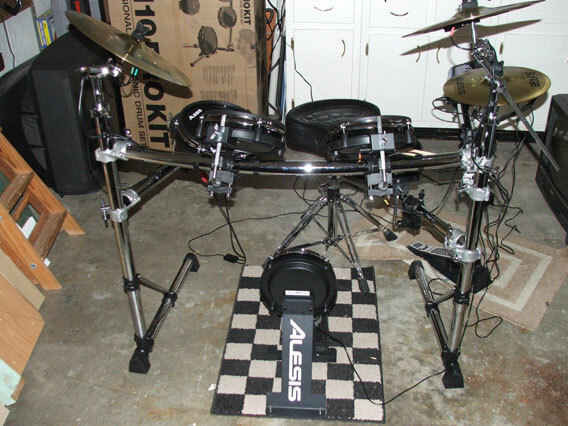 This post is my review of the new Alesis DM10 Pro Kit. 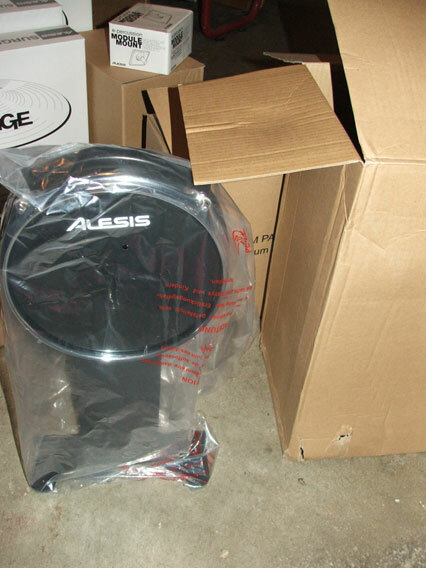 If you would like the technical data, please visit the Alesis DM10 Pro Kit’s web page. A couple things to keep in mind while reading this review. I am doing this review to two parts. The first part is the unpacking and drum hardware. The second part will be on the DM10 module itself. Also, I have never bought a complete electronic drum kit from a major manufacture ever until now. 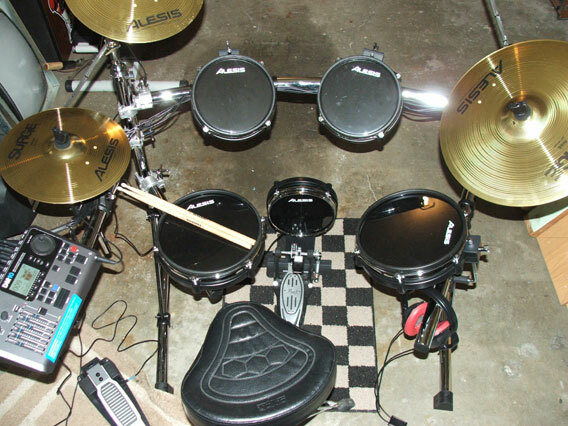 This kit cost $1500.00 and that is the most I have ever spent on any one electronic drum purchase. My reason for stating this, is to let you know that this is my spending limit on an electronic drum kit and I would guess that I am not the only one out there who lives on a budget. So take that for what it is worth. Lets get this show on the road…. The kit comes in one box. Yes, you read that correctly. When I first got the package I was a little concerned that a package like that could not adequately protect my investment. It was rather heavy as well. After I started opening the box, I no longer felt that way. Everything in the box is well packed and well organized. Every piece in the box is bagged and either packed with styrofoam (Cymbals) or fitted cardboard inserts (rack bars). As I took everything out of the packing material, I did a visual inspection of every part. Only two minor things caught my eye. First was, one of the screws on the back of the bass trigger tower was not tightened all the way. Easy fix, just used a screwdriver to tighten it down. 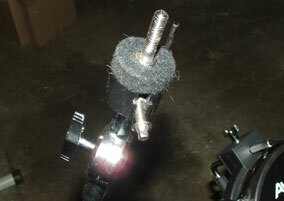 The other thing that I saw was the bass drum trigger rim was not evenly tightened in to place. Again, an easy fix. I removed the rim and put it back on. Issue solved. It has been awhile since I had to set-up a drum rack. This one took me a little time to set-up. Mainly, because I was trying to get everything in a good position as I went. The first thing when setting up the rack, you will have to locate a drum key. I recommend using the one that is provided by Alesis because it has a nice large sliding T-bar that is easy on the hand. The rack has chrome plated steel bars and includes both metal and composite (fancy word for plastic) clamps. The upright bars act as cymbal stands as well (nice touch). The metal clamps are used for the main structure of the rack. 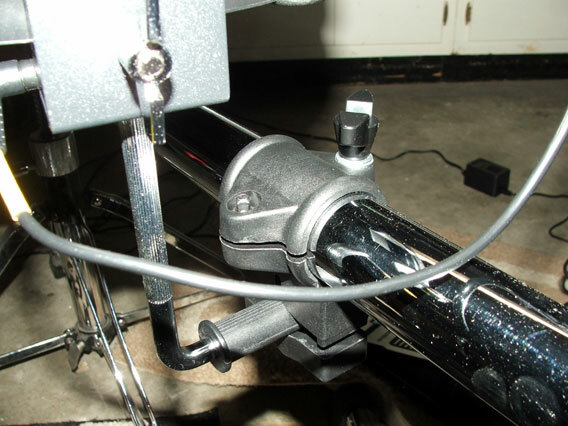 The composite clamps are used for the “L” mounts, module mount, and the hi-hat cymbal arm. I really like the metal clamps on this rack. It is not really touted as a feature, but you could feed your cabling through the rack tubes because of how the clamps are made (see picture). Admittedly, I’m not a big fan of composite (plastic) clamps. Over all the clamps work well. 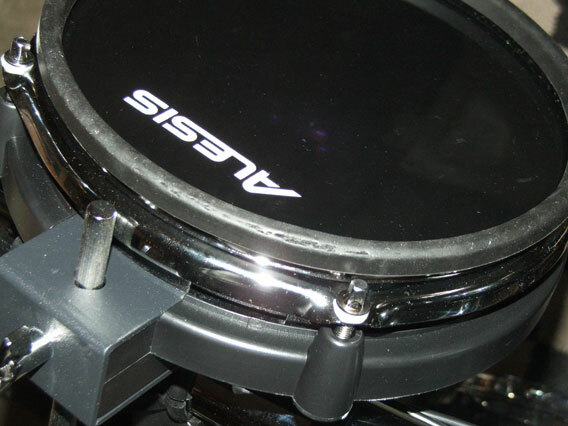 With that said, I would like to see Alesis make one small change to the composite clamps. Drop the plastic wing nut and replace it with a standard square drum screw. My reason for this is the fact that the base of the wing screw is tapered. When you try to really cinch it down, the taper ends up cracking the clamp. It does this because the base of the wing screw can’t touch the inside shoulder of the hole (see pictures). The wing screw taper is too large to fit all the way down to the shoulder so, it ends up cracking the edge of the hole. This isn’t a problem with the opposite side screw because, standard drum screws have a flanged base that sits nicely on the shoulder inside the hole. Not to worry however. By adding a couple flat washers under the wing screw, it resolves this problem (see pictures). The washers make the composite clamps a little harder to get on, but now I can tighten them rock solid. I found the drum and cymbal triggers to have a very solid feel (build wise). I think the cymbals are fantastic! 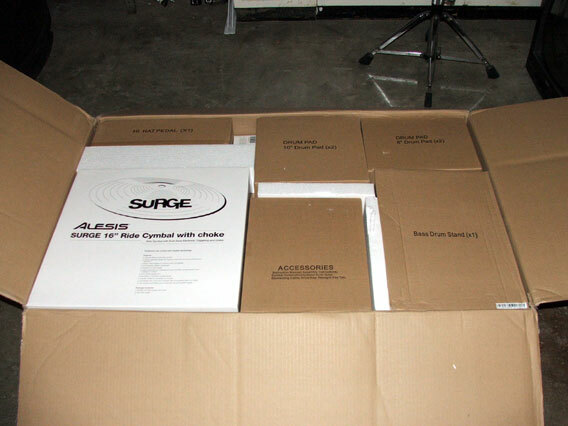 You get Alesis Surge cymbals with this kit. If you like the feel of acoustic cymbals you will love these triggers. 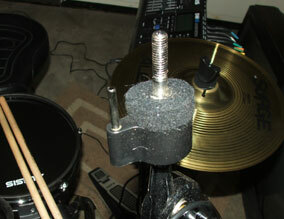 Each cymbal boom (and hi-hat) come with an anti-rotation device (See pictures). The acoustic noise is about the same as a plain plastic practice cymbal, which tends to be louder then a rubberized cymbal trigger. Just something to keep in mind. The acoustic noise level is not a problem in my house, but for those who live in apartment with thin walls, it might be problematic. At first my impression of the the drum triggers was not that great. I think a lot of that had to do with the fact that I knew some on the web have changed out the sensing system to be use with mesh heads. I do think the rubber on the rims is way too soft. Because of this, if you are a heavy hitter, they are not going to last long. Mine were starting to spilt after a couple hours of heavy use. Not a big deal for me. I like them better without the soft rubber rims anyway (can be seen in picture below). Well, what about the drums themselves? I feel the 8 inch drum pads are a bit small compared to what I am use to. The 10 inch pads I feel are a good size and I would have been happier with 10 inch pads all around. Again, I didn’t think this was that big of a deal. I could always just buy two more 10 inch pads from Alesis when they start selling them. My first impression when I started playing on the pads (without headphones and without the module turn on) was that they acoustically sounded like a thicker REMO practice pad. As I kept playing, I couldn’t help but think I was hitting a plastic bowl filled with foam. Keep in mind I’m not describing the feel of the pad, but the sound was making me believe they felt like a plastic bowl. After I turned the module on and put my headphones on, I was quite surprised! I found that the sound you hear when play actually makes a difference on how you perceive a trigger pads feel. I now noticed that the trigger actually had good rebound. A lot like an acoustic drum but a tad stiffer. I would say they felt like a cross between a rubber pad and an acoustic drum. Softer then rubber but harder than acoustic drums. They really are not that bad to play on. Are they as good as mesh? No, but they do the job really well. The kick is made the same as the drum triggers. The acoustic sound level of the bass trigger is a tad loud but, much quieter than acoustic drums. I felt the bass trigger had a good solid feel when played and it did feel pretty close to a real bass drum. My favorite part about the bass trigger was the velcro on the bottom of the tower. You put that down on a rug and it will not move. No spikes needed. I thought this was a great feature. When you open the bag containing the cables, you will notice that it is a cable snake. Each cable in the snake is sized (length) for the standard placement of each trigger. Depending on how you see things, a cable snake is a fantastic idea, or it is a horrid idea. I think the cable snake is great for those who like the “out of the box simplicity”. If you like having things set-up in an unconventional way, you will most likely not like the cable snake. You might find some of the cables a tad short. Over all, I am very happy with this kit. I would give this portion of the review an 8 out of 10. I think the above issues that I mentioned are very minor and are easily over shadowed when you consider what you get for the money. If you are using the kit as is, I believe that you would be please with your purchase. If you are a DIY’er, you will be more than please because of the possibilities that this package gets you. As a DIY’er it would be easy to change the stock drum pads to a mesh style if that is what you like. Get new cabling and run it through the rack pipes. Change out the composite clamps with metal ones and add to the rack with standard drum rack hardware. And as a DIY’er, Alesis kind of helps you out in the sense that you will end up with four extra 1/4″ instrument cables. 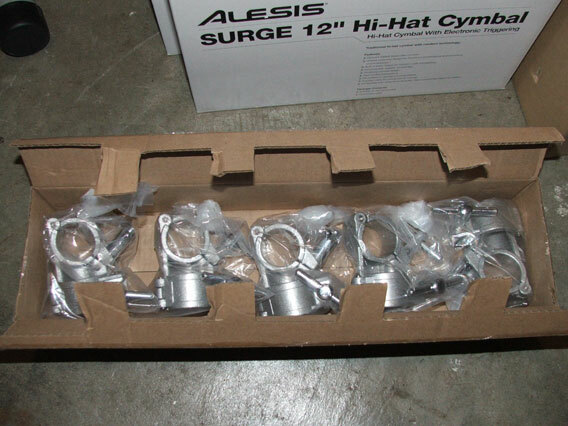 They come with the Surge cymbals, but are not needed if you use the supplied cable snake. In part two of this review I will go over the DM10 module itself. The ins and outs and the good and the bad so, check back later. I love your reviews. I just picked up my kit last night and I am struggling to get my toms loud enough. Can you point me in the right direction on how you adjusted yours? Does the module have any expansion slots for an exra cymbal and would you reccomend this kit for the price over a roland? You may want to check out DMdrummer.com. It has the largest group of Alesis DM10 users on the net. I hope that helps. Yes it does have a couple open trigger inputs. It is also very easy to expand the Alesis DM10 with an Alesis Trigger I/O. I don’t like telling people what to buy. 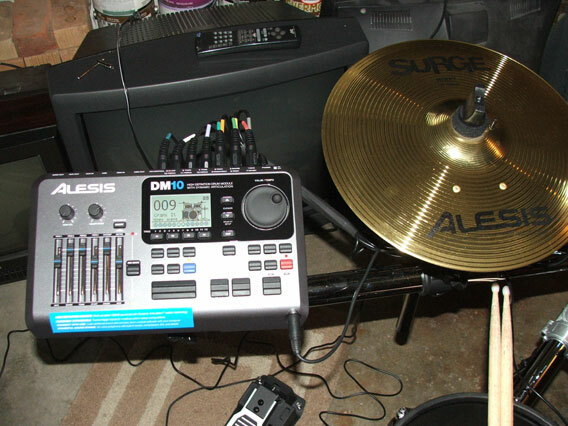 I can tell you that I use an Alesis DM10 Pro kit and I would not trade it for a Roland TD-6 or TD-9. You may want to check out DMdrummer.com. It has the largest group of Alesis DM10 users on the net. I hope that helps. My kit takes up a five foot by four foot area. I find the sounds in the DM10 to be at least as good as the TD-4 if not better. The only thing the TD-4 has that the DM10 doesn’t is a dual zone hi-hat trigger. The up side is the DM10 has many features the that TD-4 doesn’t have. Like expandability, and being able to download new soundsets just to name a couple. I hope that helps. a) the cymbals being unable to choke (i was told they could)?! b) and more importantly, often my ride or my bass drum won’t play when i hit them together (about 30% of the time)?! it’s really frustrating. any help would be greatly appreciated. Hey, im interested in getting the studio kit. Are the acoustic sounds of the toms on this louder than a normal drum pad when the module is turned off? I need to get a kit for quiet playing. The are about as loud as a Remo practice pad. They are louder than a mesh drum head. I believe there are a few videos on youtube that show just how loud they are. Try doing a search on youtube for acoustic noise on Alesis drum triggers (or something similar to that). Another good source of information on all things alesis edrum related is DMdrummer.com. It has the largest user of alesis edrum users on the new. I hope that helps. I haven’t heard any problems with crash1 not choking. The only thing I can think of is check and make sure you are using a TRS (tip, ring, sleeve) cable and not a TS (tip sleeve) cable. Also, double check that the cable is pushed all the way in the jack at the cymbal. Sometimes they can work there way out just a little. 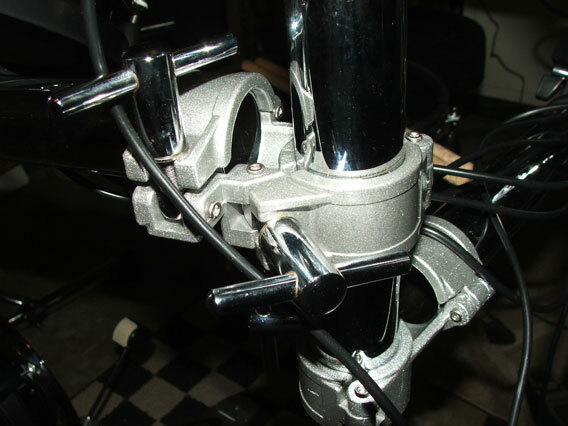 The issue with your ride and bass has to do with cross talk setting. You will need to play around with them as there is no one setting that works for all. If you get a chance you may want to check out DMdrummer.com. It is the largest alesis edrum forum on the net. There is a lot of good info about settings and such over there. I hope that helps. I bought a DM 10 module and I am using it with a set of Roland TD-7 pads. Frustration is an understatement. Do you have any suggestions on how I can tweak this kit to have better response,..better sounds? All of the EQ’s and filters and such are not explained at all (or way to simply explained) and it seems to me that, unless you’re a sound guy, understanding what does what is impossable. I’ve looked all over the internet and apparently I’m the only one on the planet using this module with rubber pads,….can ya help me? 1. I was checking the DM10 studio pads, the realhead ones, are they gonna last more than 1 year if I keep it all original? and I was worried bout the rim as well, is there any replacement for the soft rubber on them? Do they still work just as fine when the rubber is gone, probably louder though? 2. I don’t get all the crosstalk stuff, but tell me: is it module related or midi related? Because I was thinking on getting an edrum and using it with BFD. Will I still have to worry about crosstalk when using VSTs? 1) depends on how you play, but to be honest if you have to replace the foam just under the head it is no big deal. Standard drums head are changed out about once a year if you play on it regularly. So if you can replace a head, changing the very thin pad under the head should be no problem. 2) crosstalk is a trigger picking up vibration from an adjacent trigger. Yes, will will need to be concerned with it even when using VST’s. Best thing you could do, is download the DM10 product manual and read up on crosstalk. it is like I have some dead spots, like areas the size of a square inch that just aren’t as sensitive as the rest of the mylar head. It is like there is a hole beneath it, or like the rubber on that spot doesn’t translate the hit to the trigger. I’m getting it just on the snare drum pad. I know it sounds weird, but hope you get what I’m trying to say. Have you been able to try out the DM8 Pro? Any idea what one loses out on going for the DM8 as opposed to the DM10? Will this kit do the job for a band playing out a couple times of month and as a practice kit? Or should I seriously look at something like the Roland TD-9K2? Or even wait for the new Yamahas. Like I said, I love the Alesis DM10 module and the price of both the DM10 Studio and Pro, but without the mods will it last awhile? Thanks for taking the time to answer as this is a serious purchase but one I would like to make soon. I used a DM10 Pro Kit (with the mods from that video I did) and played out with the kit several times with no major issues. The mod is mainly to change the feel of the pad. If you are going to be playing out, I would go for the Pro kit. If you want to get a Roland TD-9K set, that is a good kit as well. You really should try to find a place that has them both and try them for yourself. If you don’t want to do the mod of the Alesis pads and you like the feel of mesh, then I would save up for a kit that have mesh head triggers on them. I prefer mesh, that is why I did that video. I didn’t like the feel of the stock Alesis pad. To me it was a big deal to mod the pads but, I know that many users are not comfortable with modding things. I hope that helps. Thanks Phil. I am probably driving you nuts – but this is truly helping. 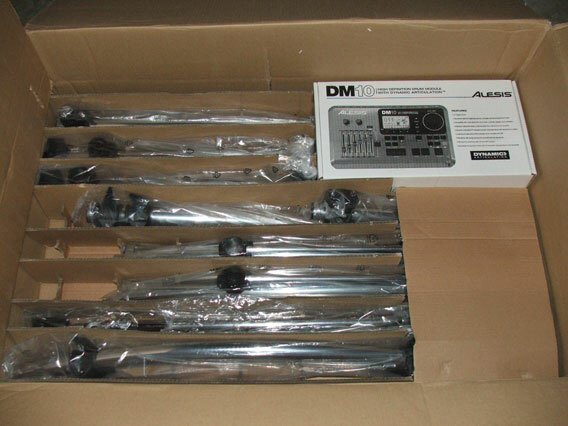 I take it you are saying the Alesis DM10 Pro should be reliable for playing out. And you don’t have issues with the quality of the set. If I decide the TD-9K2 is for me, can I assume it will work well triggering the kits in Ableton? The Alesis DM10 module seems well suited for Ableton. Go to :50 in the video. PS: We are an electronic band. I am not actually the drummer, but no drummer has an electronic kit and the band prefers one for the music we play. I bought the Roland TD-9K2. Sounds good. The Roland TD-9 is a great kit. You shouldn’t have any problems using it with your computer. The place I bought the Roland TD-9K2-S was able to match the price of the DM10 Pro, free shipping and even threw in the Roland drum gig bag. can u set the kit up left handed?? I don’t see why you can’t. I hope that helps. Yes, you can even program the amount of effect you want on the drums, the decay, and the tone. I hope that helps. Hi! We’ve just bought a DM10 Pro, do you know if we can use a real hi-hat + controller with the module. We were thinking about using a Yamaha RHH-135 or similar. Thanks in advance ! The Yamaha RHH-135 will not work with the Alesis DM10. If you really want a real hi-hat stand, you should look into the Pintech HHC RYC controller or the Pintech 1300HHC IMC VisuLite hi-hat cymbals with Integrated Controller. I hope that helps. why the yamaha RHH 135 wont work with dm10`? I just drying to get it workin but not getting it yet. i havnt tried out an elec kit yet so im was wandering if there is a diff between an acoutic feel n an elctric… u kno wat i mean.. Yes. Electronic drums do feel slightly different than acoustic drums. If your edrums use mesh head, they will have a little more rebound to the drum. 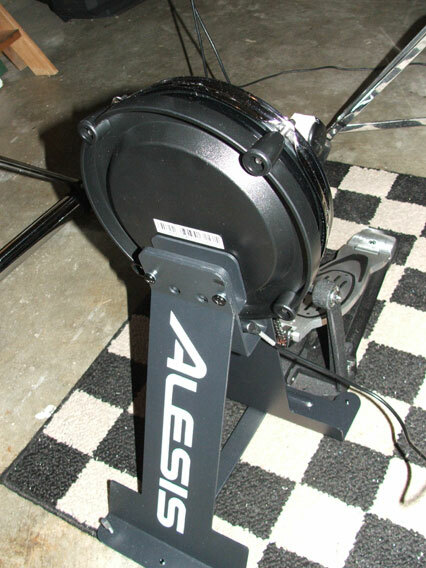 If your edrums are like the Alesis DM10 heads they will have a little less rebound than an acoustic drum. I hope that helps. 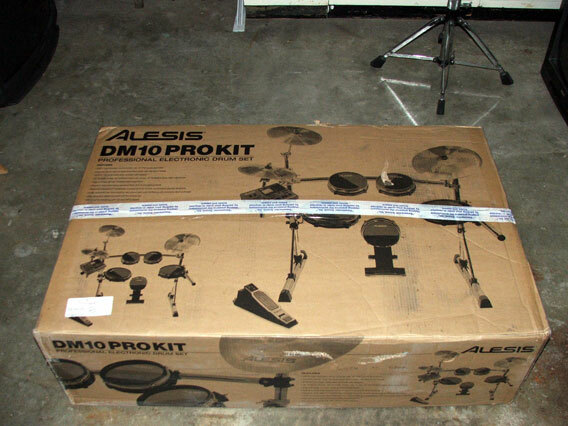 Just so you know, Alesis discontinued the DM10 Pro Kit. You may want to look at the newer DM10X kit. If you are an iPad user you might want to check out the Alesis DM Dock Pro Kit. I hope that helps.